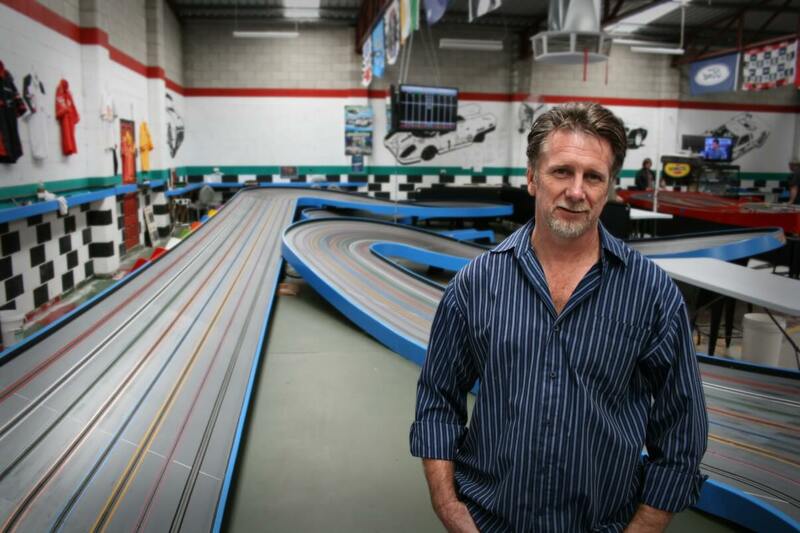 For Thunderbird Slot Racing owner Chris Osborne, slot cars and slot car racing has been an almost lifelong passion. It was in the late 1960's when, as a teenager, Chris first became involved with slot cars, racing at the now closed Shelton Raceway on Franklin Street in Adelaide's CBD. Many years later, after purchasing a Scalextric set as a Christmas present for his young children, Chris again became drawn into the world of slot car racing. What started out as a few visits to the local hobby store for new cars and track pieces to expand this Scalextric set eventually led to joining a group of slot car enthusiasts racing at private garage tracks around the northern suburbs of Adelaide. It was while racing with this group that Thunderbird Slot Racing was born in 1998, as a means to supply this group with new cars and parts. With the popularity of slot car racing rising and an increasing number of enthusiasts joining, racing at these garage tracks had become impractical. In 2000, Chris made the decision to turn what was then a part time hobby into something bigger and opened our first shop and raceway in a small building at Parafield Airport, housing two four lane tracks and providing a permanent racing venue. Quickly outgrowing this small space, two years later in 2002, we moved to a larger premises in Salisbury, expanding the raceway to four, four lane tracks and for the first time, a 1/32 scale drag strip. In 2012, we seized an opportunity to move into greatly expanded premises in Pooraka, giving us the space to create what is now Australia's largest slot car raceway, with seven tracks providing 36 racing lanes and a 1/24 scale drag strip. Thunderbird slot racing is a specialist slot car retailer and racing venue. We're also slot car enthusiasts ourselves, with a long history of involvement in the Australian and South Australian slot car racing community, which we continue to support, having twice hosted the Australian Scale Model Nationals in 2012 and 2015 as well as being the home of the Slot Masters Slot Car Club. We pride ourselves on keeping in stock an extensive range of cars, spare parts, performance parts, sets and accessories. If you’re a beginner looking for advice, an experienced racer after the best performance parts or a collector after that rare car, we'd love to help you. Our raceway also makes a great birthday party and event venue. We have dedicated birthday party facilities and offer private venue hire out of hours. Visit our raceway page for more details.